The San Lorenzo golf course is situated in the Golden Triangle of the Algarve on the south-eastern corner of Quinta do Lago. It borders the nature reserve of the Ria Formosa between Faro International Airport and Almancil. It is a seven km drive from the EN125 in Almancil to the club house in the heart of the resort, and around ten km from the exit 13 of the A22 motorway. The course, designed by the American golf architects Joseph Lee and Rocky Roquemore, was opened in 1988. It takes advantage of the wonderful topography of the Quinta do Lago estate, winding its way gently over undulating pine woodland down to the coast of the unique lagoon landscape. San Lorenzo Golf Course is different from the other courses at Quinta do Lago, but the quality of the course is just as good. It has some holes of exquisite beauty, mainly those near the Ria Formosa Nature Reserve. 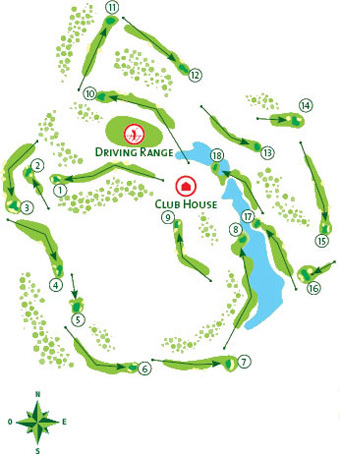 The course is laid out in a figure of eight with the clubhouse in the centre and Bermuda grass fairways providing perfect playing conditions all-year round. The elegant San Lorenzo club house with a golf pro shop, comfortable changing facilities, welcoming bar and restaurant is situated at the heart of the course. The excellent practice facilities include a great driving range, several putting and chipping areas and a practice bunker. The PGA professional offers extensive and specifically tailored programs to individual players or groups. Even by the high standards of Quinta do Lago, San Lorenzo golf course is something special. It was recognized in 2013 as one the world's Top 100 courses by Golf World magazine. Special terms are available exclusively to guests of the Dona Filipa Hotel and Amarante Formosa Park hotel.